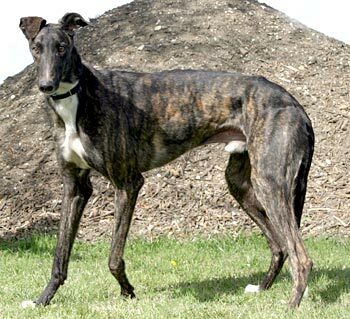 Tom, aka Tomco Showdown, is a stunning, black brindle, 2-year-old male, born February 8, 2007. 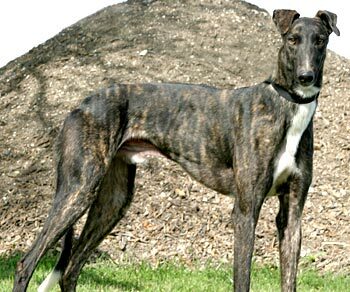 His sire is Coldwater Keelin and his dam is KB’s Apostle. Tom’s 13-race career was all at Valley Race Park starting January 2, 2009, and ending March 19, 2009. 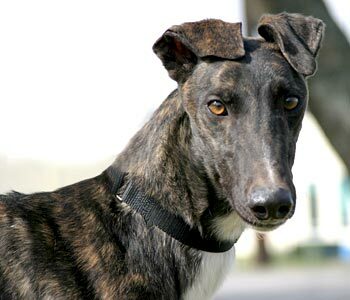 Tom’s sights were not set on a racing career, but on finding his forever home! With his unique white markings, Tom stands out in a crowd. Tom’s cat test: Tom has passed his cat test. He was excited about his new surroundings, and the cats were certainly an interesting part of it. He went in for some quality sniffs, but turned away on his own every time. He roamed free without a leash or muzzle.